Destination weddings are popular for a number of reasons, but they do require extra planning in everything from when to send invitations to the type of makeup the bride will wear. Rick DiCecca, global makeup stylist for Estée Lauder, travels the world as a roving brand ambassador and creative consultant. In this exclusive interview, he offers advice for destination brides to look their very best on their wedding day. 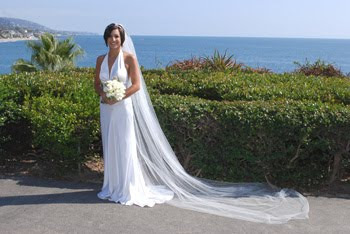 Are there special considerations a destination bride should make so that her face looks beautiful in the wedding photos? A month before you go to your destination, get your beauty regime and any procedures you plan on having done, such as facials or Botox injections. One mistake brides make is getting a peel at the hotel spa right before the wedding. Don’t do it! No one wants to look raw and orange in her wedding pictures. What type of cosmetics do you recommend for destination brides? Use a humidity-proof foundation, such as Double Wear Light Stay-in-Place Makeup SPF 10 (compare prices). It’s non-transferable; once it sets, it won’t come off on your clothing, veil, or anywhere else until you remove it. Double Wear Light also contains a sunscreen, has skincare ingredients in it, and photographs beautifully. How can a destination bride know what shade of foundation is best for her? The biggest issue with foundation is not finding the right color. The last thing you want to see in wedding photos is a line of demarcation. Ask for iMatch at the Estée Lauder counter. It’s a way we have of determining the intensity level, undertone, and shade of a woman’s complexion that yields the perfect shade, perfect finish, perfect match. There are many variations but a shade for everybody. What advice do you have for a destination bride who doesn’t normally wear makeup? Makeup can transform a woman’s appearance so that her true self comes through. The ideal is to look like yourself, but even more beautiful. Wear foundation on your wedding day so that years from now you won’t look at your pictures and see skin that looks blotchy and uneven. Foundation perfects the look of your skin, its texture and luminosity. Double Wear Light foundation looks like skin, not makeup, when it goes on. What items do you consider essential wedding-day makeup? At a destination wedding, you want to make sure makeup stays on your face and doesn’t move. So choose water-resistant products. The basics are foundation, eyeliner (I like our new formula Double Wear Stay-in-Place. It comes in seven shades and gives you 90 seconds of play time. After that, it’s water- and fade-resistant and you remove it with eye makeup remover). You also need a mascara (compare prices) that defines the lashes and creates length and definition. You’ll also want to use a bronzer or bronzer or cheek color. Bronze Goddess (compare prices) is a soft matte shade that can be used as blush or all over. For a little more color, add a special-effects blusher to the apple of the cheek, such as Peach Nuance or Rose Nuance. What advice do you have for a destination bride who wants to have a healthy tan but doesn’t want to expose her face to the sun unprotected? If you don’t have the money to get tanned at a spa, use a great exfoliator (compare prices) and a great self tanning product such as Bronze Goddess Self Golden Perfection Tanning Milk or Gel (compare prices). Alternately, save money by using a washcloth and your favorite body foaming gel as an exfoliator. Pay special attention to the back of arms, knees, and feet. If you use self tanner on dehydrated skin, the chemical in the product will grab it and give an uneven, blotchy finish that looks fake when it dries. Brides consider a range of hairstyles before settling on the one they will wear on their wedding day. If the same applies to makeup, what are the styles of bridal makeup that brides should consider? And what distinguishes them? Natural: Ideal for beach weddings, Natural makeup uses the fewest number of products to accentuate features without going overboard. Classic: Subtle and chic, Classic makeup provides soft definition. Wear it at a hotel destination wedding held indoors. It’s a hit with older brides and MOBs because it’s not too luminous but it helps a woman look like herself, only better. Dramatic: This is a super-glamorous look and palette for a confident woman who’s comfortable wearing makeup and wants to be the center of attention. Romantic: Perfect for a destination wedding in a garden setting, the Romantic palette is soft and rosy or peach-toned. A bride typically visits her regular hairdresser to try out different wedding-day hairstyles. How can she try out wedding day makeup looks in advance? Go to an Estée Lauder counter and choose a beauty advisor whose makeup you like. Or watch one of the artists at work, and see which results you like. Then ask if you need to make an appointment to have your makeup done. How can you get the most out of a pre-wedding makeup session? Reveal when, where, and the time of day the wedding will take place. Bring a tearsheet that shows the type of makeup you are attracted to. Carry a picture of the dress, or even a piece of fabric. The neckline is important to mention. Find a makeup artist who will do what you want to do. Shop around. Take pictures when your face looks the way you want it to. Ask for a face chart before you leave that identifies which cosmetics were used. Go home and practice, practice, practice. Use the lipstick trick. Choose a beautiful lip shade and apply lip liner first. Don’t just outline the shape of your lips. After that, fill in your entire lip area with the lip liner before applying lipstick. If you do that, it will keep the cosmetic's finish and color longer than if you wore lipstick alone. And if you want to be really on trend, skip the lipstick and just use the full lip liner with a High Gloss color finish (compare prices). According to the Transportation Safety Administration, passengers may only carry 3 ounce or smaller containers of liquid or gel in one clear, quart-size plastic bag. While a bride can certainly fill her checked luggage with cosmetics, there’s always the chance that a critical suitcase will go astray. What are the essential cosmetics a destination bride should carry onboard in her baggie? All the items we’ve talked about can fit in a quart-size bag. And you can transfer quantities of self tanner, body lotion, and other liquid cosmetics to little bottles to bring aboard. On occasion you’ve been flown to a destination to work as a wedding party’s makeup artist. 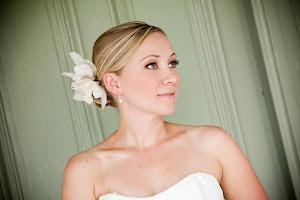 What’s the advantage of having a professional handle wedding-day cosmetics for a bride? I’m on call from the moment we start the process till the last picture is done. A bride gets the look she wants and the finish she wants. She doesn’t have to worry about her face being shiny or her lipstick faded when formal pictures are made. Are there new cosmetics or treatment products that destination brides should be aware of? A product no bride should be without is Advanced Night Repair (compare prices). It goes under moisturizer and repairs environmental damage, forces the skin to perform at its optimal best, holds moisture, and gives skin luminosity and softness. Don’t be afraid to make requests. Your destination wedding is your day. A bride needs to be able to say to her makeup artist, “This is the way I want to look,” and be happy with the results. Estée Lauder used to say our goal is to make every woman beautiful, and I believe in that philosophy completely.